・Voltage dividers, shown below, are circuits with series of resistors to divide high voltage into smaller voltage. 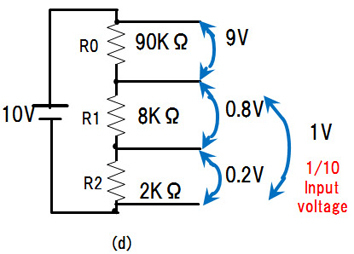 Input voltage is divided in the ratio of the resistance. ・Precision resistors are required because the tolerance and TCR of the resistors directly influence the divided voltage. Relative tolerance and TCR of multiple resistors are specified in RM series(network resistors) only. ・Strain gauge is a sensor that detect the amount of strain or pressure by change of resistance. 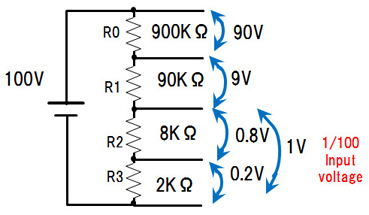 Basic circuit is shown below. ・Application ： Strain gauge, Pressure sensor, Flow sensor including gas sensor for automobile, etc.